The Microsoft Word file format, .docx, was designed by Microsoft as a default format for the Microsoft Office 2007 suite. However, despite the popularity and widespread adoption of Office 2007 applications, the .docx format provided numerous compatibility issues with previous Office versions from the very beginning. PDF users, in particular, had a hard time finding a direct PDF to .docx converters. As a result, they had to resort to multi-step workarounds, converting PDF to .doc first and then re-saving the file from .doc to .docx. Fortunately, with each succeeding version of Office since 2007, the format has gained better backwards compatibility. It is now a widely used default exporting and saving file format. Moreover, you can now find PDF tools that serve as a direct PDF to docx converter. Here is how you can convert to docx from PDF offline by using PDF Converter Elite or online with PDF to Word Converter. 1Open a PDF in PDF Converter Elite and click the Word icon in the toolbar menu. You can also choose PDF to Word conversion from the File menu. 2Select the area of the PDF you wish to convert to .docx or fill in the Page Range field if you want to convert particular pages of a document. If you want to convert the whole document just click on Select All Pages, although that option is highlighted by default. By clicking on one of the selection options you will enable the Conversion Mode menu as well as the Convert button. 3Click on the Convert button. If you have more than one PDF file to convert to docx, you can use batch conversion and save time. Click on the Batch button in the toolbar menu and then on Add Files. When you select the PDF files from your computer, click on Browse to define where you will save the converted files. “Convert to” option is already set up by default to convert to Word so you don’t need to change the output format. Lastly, enter the captcha and click on Convert to turn multiple PDFs to docx at the same time. If you don’t like to install anything on your computer you can convert PDF to docx online instead. Online PDF converter tools are a particularly good choice when you don’t have enough memory on your computer or when you use someone else’s computer. PDF to Docx Converter online is free and secure to use and it works on every operating system. With this tool you can convert PDF files to docx on Windows, Mac, Linux and even on a mobile browser. 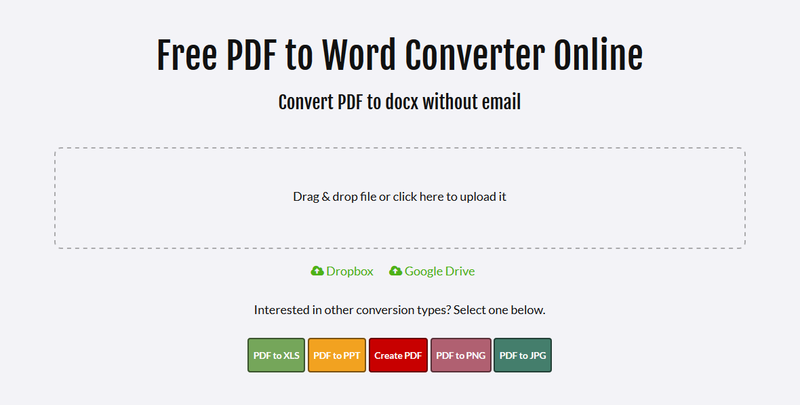 This is a two-step process, drag and drop the PDF file you want to convert. The conversion starts immediately and when the file is converted, click on Download file. In addition to a regular uploading of files from your computer, you can import files from Google Drive or Dropbox. All converted files are automatically deleted within a day so you don’t need to worry about privacy.